As mentioned previously, my friend Anne and I have found the secret cure for dinnertime insanity…it involves an ungodly amount of Ziplock freezer bags and suitcases full of meat…but it’s TOTALLY worth it when you can pop a meal out of the freezer, light a candle and enjoy family vs. meal prep! 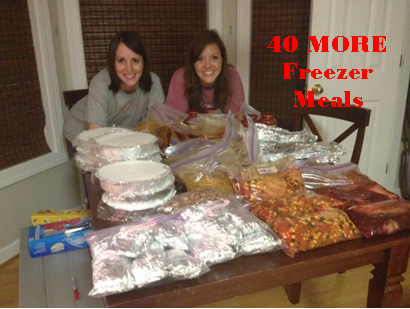 We rolled up our sleeves for the third month in a row and knocked out 46 meals. Let the “Hallelujah Chorus” ring from sea to shining sea. Some friends and neighbors have asked for the recipes…and if you’d like aching feet for a day but affordable, healthy meals for a month, see below! This month’s menu: We multiplied each recipe by 4 so each family had 8 servings (2 dinners). Again, we used Ziplock Freezer Bags and disposable round aluminum tins from the Dollar Tree. For the pizza we used aluminum foil! BBQ Pulled Pork tastes great on a baked potato! Greek Feta Burgers this was a crowd-pleaser at our most recent deck party! Crock Pot Beer Chicken this tasted amazing last night with mashed potatoes and broccoli! Spaghetti Bake just boil whole wheat pasta, toss it in the disposable pan, brown ground turkey and lean ground beef add Light & Fit Aldi Spaghetti Sauce and some mozzarella cheese to your liking! Roll out dough, add ingredients, slice into strips, place in disposable pan and cover. Mix in freezer bag. Repeat for each bag. Day of cooking place contents of bag in crock pot and serve as taco salad, over a potato, in tortillas, etc! To prepare the Chuck Roast cook roast overnight in crock pot with some chopped onions and 2 cans of organic Beef Broth, 1 can of water, a Fajita packet and a Au Jus packet on LOW overnight. In the morning shred roast, spoon cooked onion out of sauce and add to the shredded roast, along with the can of diced green chilis. Warm sauce and add heavy whipping cream. Assemble Enchiladas to preference:Lay out a tortilla, put the meat in the middle, sprinkle some cheese and approx 1 tablespoon of the sauce. Then roll them up. You could also layer the olives, beans, and rice here too. Place in disposable pans. Sprinkle with Mozzarella and/or Mexican Cheese! Stir in 12 oz bag choc chips. Chill dough in fridge. Then roll into little balls. Freeze on cookie sheets. after they freeze put in freezer bag. Bake from frozen. 350 for 11-13 minutes. So, put on your fave Pandora station and get to cooking. If you can make it through the grueling shopping spree to purchase all the ingredients, you’ll be sure to make it through assembly day. And you’ll thank yourself when you have a table full of healthy & affordable meals! The pudding on the cookie recipe, is it instant pudding? Sounds really good. Can’t wait to try it! The crockpot tacos—how long in the crockpot? Low or high temp? Approx how many servings per bag does this make?